The pieces listed here have been studied by Susan Brown Stoddard, Whitney Stoddard, and Brooks Stoddard. Floral motif in a continuous scroll with moulding on edge. Very low relief. Worn. This piece is possibly a fragment from a Roman altar. It was donated by a previous owner of the site. Limestone, very fine yellow-gray (19.00 x 13.00 x 13.00 cm). Part of a wreath, about one quarter of circle remains. Limestone (29.90 x 19.00 x 15.50 cm). Corner of a Corinthian type capital. Carved concentric curved lines in relief. Abstract pattern. See capitals in Burgundy and Grenoble. Limestone (9.00 x 8.50 x 5.50 cm). Corbel. Two parallel incisions with dots above them may suggest eyes and nose. Possibly a horse? Most details abraded and illegible. Limestone (34.00 x 23.00 x 14.00 cm). Large section of cornice or impost block with rinceaux encasing palmettes. Triple scored vine scroll in a flat somewhat incised 2 dimensional relief of a linear etched type. Patterned effect. Limestone (19.50 x 58.00 x 28.00 cm). Cornice molding with one shell-shaped rosette and four 7 pointed stars encased in vine scroll with double layered palmettes. Highly stylized and graphic with zigzag patterns on leaf edges and striations throughout. Relates to a number of pieces found at Psalmodi. Found together with and related to PS87.096.002. Limestone (19.00 x 86.50 x 37.50 cm). Large section of cornice with rinceaux. Perhaps some drill work. Swelling vine scrolls with 3 tendrils and ending in four and a half broad turning palmettes, very spherical in shape. Horn-shaped elongated palmettes between vine scrolls. Deep relief with some undercutting. Limestone (20.50 x 72.00 x 32.50 cm). 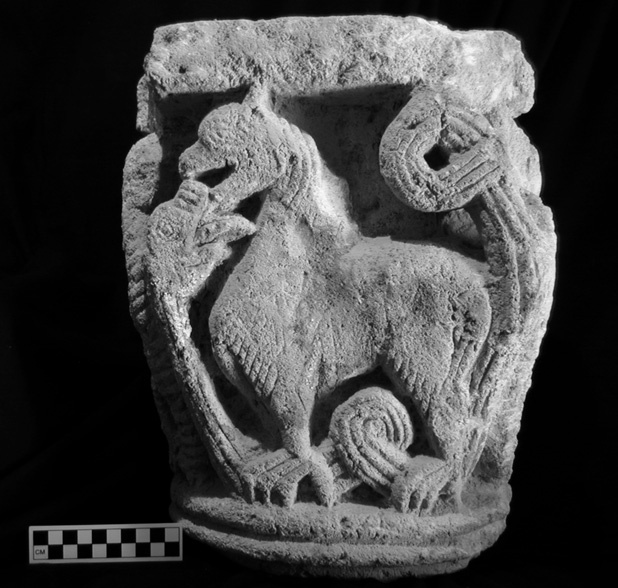 Carved capital with image of griffon in profile and snake on each of four faces. Flat abacus and double-filleted base. Deep relief with incised detail. Very animated and stylized with griffon's mouth open as if to attack serpent. Each side of capital in different condition of preservation: fairly crisp on two sides, worn rather badly on third and very badly on fourth. Limestone (35.50 x 25.00 x 30.10 cm, including base and abacus). Cornice moulding with abraded palmette and rinceaux. Thick, rope-like vine scroll somewhat more schematic than organic. Palmette with concave leaf segments. Limestone (8.00 x 19.50 x 11.00 cm). Limestone (8.40 x 5.00 x 5.50 cm). Hand showing 4 fingers remaining, and edge of sleeve. Elongated form, somewhat graceful. Limestone, coarse with distinctive surface revealing organic composition of stone. (9.80 x 6.10 x 3.10 cm). Historiated capital with Massacre of the Innocents. Shows soldier striking baby held by mother. Figures broken off at knees. Few surfaces remain beyond soldiers' chain mail. Faces badly abraded. Joins to PS70.001.047. Published Alan Borg, "Psalmodi", Gesta, vol X 2, 1071, 67. Also published John Nougaret et al "Inventaire general des monuments et des richesses artistiques de la France", Gard. Canton Aigues-Mortes 1973, I, 98: II, 254; III 776-1/2, 256, III 788-1/3. Limestone (21.60 x 185.00 x 14.80 cm). Limestone (155.00 x 18.00 x 9.00 cm). 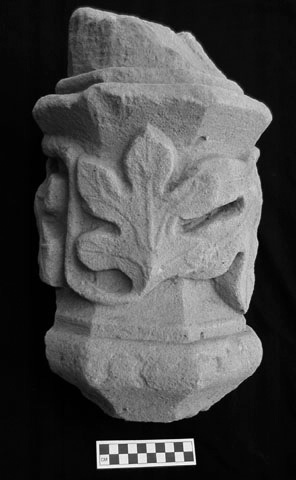 A projecting group of leaves, part of a twelfth century Corinthian Romanesque capital. A finely carved bunch of leaves on each side with central spray of leaves with deep drilled indentations in the middle. Quality - high. Limestone (10.00 x 5.00 x 6.00 cm). 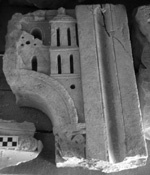 A fragment of miniature architectural form, probably from an altar frontal. On the right, a vertical panel with two flat panels flanking a conclave section. Joining that to the left is the beginning of an arch, about half the arch remains. 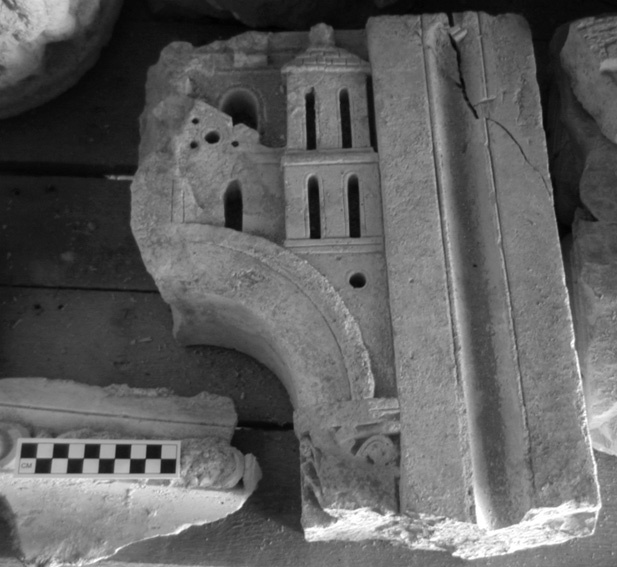 Remnants of Corinthian capital are found under the arch. Above the arch are a tower, three windows and a tile roof, to theleft of tower, a structure with a window and overhanging triangular roof with four small round openings. Two other pieces were also found which are part of the same altar. Limestone (63.50 x 38.00 x 9.50 cm). Part of a round capital or springer. Has square hole in center. Rich acanthus-type foliage runing in regular pattern around the form. Good deep carving with fine details and use of drill which creates a three-dimensional quality to surface of relief, emphasizing shadow and light effects. Somewhat worn and many leaves broken. Medium fine limestone (7.50 x 9.00 x 14.60 cm). 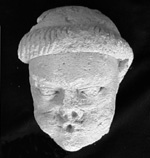 Head of male showing tonsure in braid-like pattern and showing pursed lips (O-shape). Well-chiseled articulated eyes with precise lines forming lids. Nose and mouth damaged. 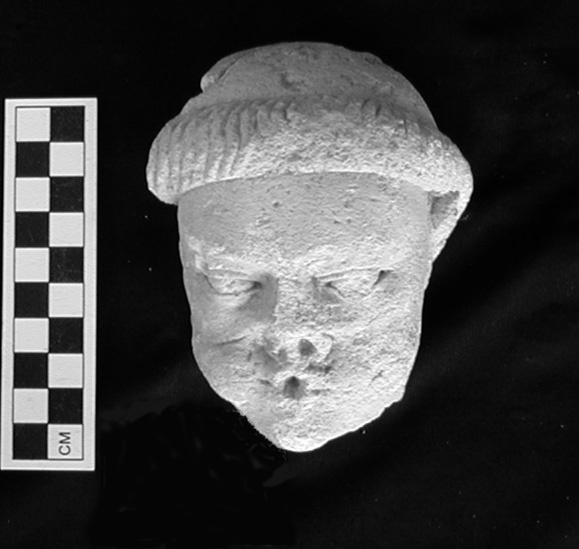 Possibly from capital (or abacus or corbel) because of small size and whistling expression of face. Limestone (11.00 x 9.00 x 6.50 cm). Foliate design in horizontal relief, possibly from springer, capital or other architectural component. Floral moulding, bevel cuts in drill work. Smooth limestone (14.00 x 12.00 x 4.00 cm). 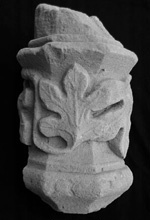 Fragment of a corbel quatrefoil carved with deep undercutting in the quatrefoil and extending back 6 cm from the front face of the quatrefoil. Carving extends back on all four sides. Limestone, coarse (7.00 x 5.00 x 8.00 cm). Small column capital. The motif encircling the cushion appears to be an arcade of pointed tracery-like forms, perhaps arches. Limestone (17.60 x 15.20 x 16.40 cm). Three petaled leaf with delicate serrated edges in triangular fragment. Limestone, creamy yellow (11.00 x 8.00 x 8.00 cm). Capital carved on four sides. On three sides are large, broad, flat fig leaves with raised veins. Leaves have deep voids between them for a shadow affect and overlap each other. Fourth side shows fragment of one, possibly two, armorial shields with a relief of an agricultural tool, possibly a pruning hook. The shaft of the capital is octagonal and the ribbed lines of the octagon are carried lengthwise through the moulding and capital. Limestone (44.00 x 25.00 cm).